The accuracy of the data collected by ultrasound instruments is paramount in the interpretation and diagnostic utilization of the information collected. Are you an IDTF ? From the list of performance standards to maintain your Medicare billing privileges you must: " Have testing equipment calibrated and maintained per equipment instructions and in compliance with applicable manufacturers suggested maintenance and calibration standards." Routine QC testing must occur regularly; a minimum requirement is semiannually. Now you can save time, lower operating cost and improve ultrasound quality. Know the True Source of Ultrasound Quality. Modern, digital ultrasound systems have sophisticated internal self-test diagnostics. The ultrasound signal path and control logic are evaluated reliably and objectively. But, the most important link in the data chain - the ultrasound transducer - is not objectively tested, and probe performance is critical to the diagnostic value of the images and the accuracy of your measurements. Traditional QC methods have not kept pace with the changes in ultrasound technology. If you have ever tried to obtain objective, repeatable QC results by scanning a tissue phantom, you know it's impossible. It's well known that even minor system control changes will produce a different image; not very scientific and not very useful for Quality Control. But now there is an objective and reliable QC method that eliminates the uncertainty. The transducer is the most often damaged and the most expensive replacement part of an ultrasound system. Objective testing reveals the true source of ultrasound quality and maintenance cost : the probe. By having your probes tested before a warranty or service contract expires, you will ensure efficacious clinical results and improve the bottom line. If your equipment is under service contract or warranty, replacing a defective probe is FREE. 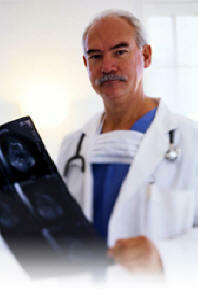 You paid for a probe that works properly and every patient scan is equally important. Why wait until probe damage is so advanced that part of the image is missing? If your ultrasound is serviced by the in-house BioMed staff, you can increase the savings and improve the clinical quality by on-site QC testing. Here’s how. If discovered early, a damaged probe can be repaired for one quarter of the cost of replacing the probe. If a defective probe cannot be repaired and must be replaced, protect yourself - have it tested before you pay for it.